“It’s great that you like us so much, Deb, but you should buy a backpack and try hiking on your own too,” said my Outward Bound Instructor after my seventh course. 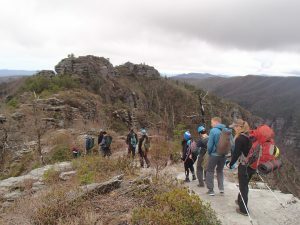 You see, I had no exposure to hiking or backpacking until, as an adult in my late 30s, I signed up for a four-day backpacking course with the North Carolina Outward Bound School. It was so completely different than anything I had ever done. It was exhausting and exhilarating at the same time. Being outside, experiencing the beauty and solitude of nature, being disconnected from my phone and computer, learning new skills and being challenged was a constant high; I knew immediately that I would be back for other, longer Outward Bound courses. I was hooked, and every couple of years thereafter I would take a trip with Outward Bound to get my outdoor fix – I tried canyoneering, rock climbing, desert backpacking and dog sledding. But my new love of the outdoors didn’t come with the confidence to venture into the wilderness by myself in between courses. So, on my seventh Outward Bound course, one of the instructors pulled me aside and suggested that, when I got home, I buy a backpack and go hiking on my own. When I said that I couldn’t possibly do that, she laughed and said that of course I could. She tried to assure me that I had all the knowledge and skills needed, but I wasn’t ready to believe it. 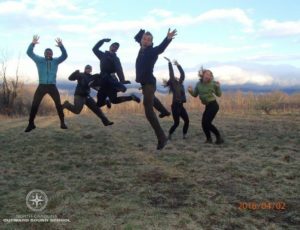 I kept thinking about my instructor’s advice, though, and the following year I signed up for a 50-day intensive, Outdoor Educator course for those interested in pursuing careers in the outdoors. During the course, and the Wilderness First Responder training that was part of it, I started to believe in my own outdoor capabilities. In fact, when the instructors taught us the SMART method of setting goals (Specific, Measurable, Attainable/Achievable, Realistic and Time Bound), I announced that I wanted to thru hike the Appalachian Trail within the next three years, a goal that I previously wouldn’t have dared to dream. 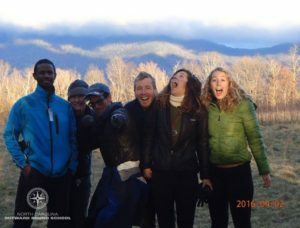 The instructors, knowing my past struggles with self-confidence in the outdoors, continually challenged me to take leadership positions in the group and to expand my comfort zone. During the last few days of course, our crew participated in an “unaccompanied final”, in which we hiked the 35+ miles back to the base camp as a team without the help of our instructors. The realization that our team of students had learned everything we needed to safely navigate that distance, ford a river, assess risks, and make group decisions was incredibly empowering. When I returned home, I bought my own backpacking gear and started venturing out by myself and with friends. I joined a volunteer wilderness search and rescue group. I became a trail overseer, trail maintainer, hike leader, and Leave No Trace trainer. And in 2017 (at age 55), I set out on my own to thru hike the Appalachian Trail. On that hike from Georgia to Maine, I had lots of time to reflect on how much my life has changed since those encouraging words from the Outward Bound instructor. The many lessons I learned from Outward Bound gave me everything I needed to finish the 2,190 mile Appalachian Trail in just under five months. I’ve also realized that I’m not done yet! I’m planning to hike the gorgeous Pacific Crest Trail – 2,660 miles from the Mexican border to Canada – in 2019, and I can hardly wait!